Wyoming Center for Political Economy: You Want to Raise Taxes on This Economy? 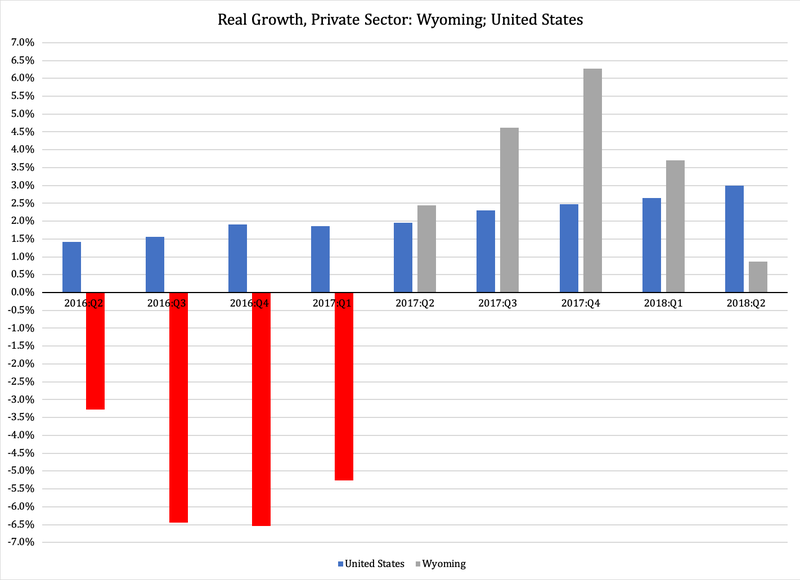 The Bureau of Economic Analysis has released the state GDP growth numbers for the second quarter. The bad news is in the numbers. The annual growth rate for the Wyoming economy was a pathetic 0.18 percent. Compare this to the U.S. economy, which grew at 2.87 percent. * If we isolate the private sector, the discrepancy was less embarrassing: 0.87 percent vs. 2.99 percent. That is still a major difference, with the national private-sector growth rate being 3.4 times higher than in our state's economy. But what about Wyoming? Well, if the $100 had neither grown nor shrunk, it would have followed the dashed line in Figure 2. But it did not follow the dashed line. 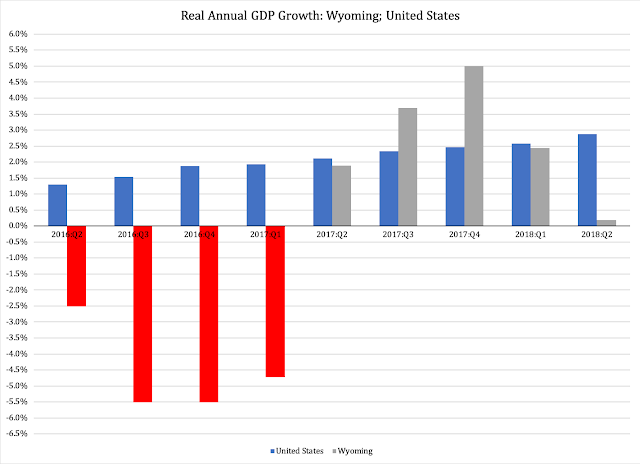 The $100 in the Wyoming account shrunk to $88.86. 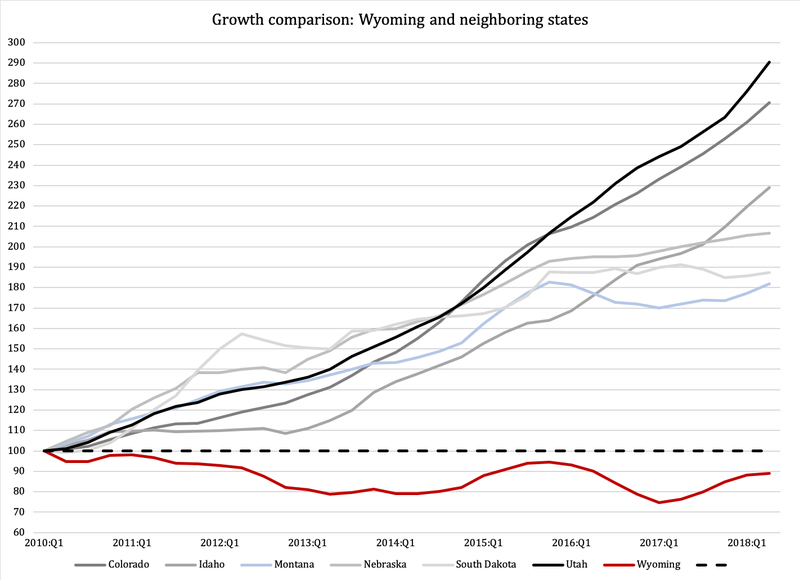 Our state's tax base is smaller today than it was at the bottom of the worst economic recession in almost a century. How big would the difference have been between us and our neighbor states, if we had raised taxes already in 2010? *) This figure is the annual growth rate. It is not to be confused with annualized growth. Some media pundits prefer to use the latter, which is then often compared to annual growth without anyone realizing the error. Back in September, I explained the difference and its consequences over at Larson's Political Economy.